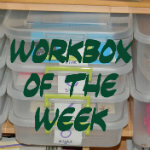 I am always interested in what others are putting in their workboxes, and so I wanted to share one awesome thing in my workbox each week. This week is our Paint Sample Color Match. I got this off of another blog, and if you think it's your blog, email me and I will credit you. It's simple to make and cheap. Go to the paint section and get two copies of the paint strips that you like. I got two of each color in the rainbow. Cut little pieces from one set of the paint strips and glue them onto the tip of some wooden clothes pins. Mix them up and let your student match the colors. Margaret enjoyed this activity. I only presented her with three of the paint strips so she wouldn't get overwhelmed and bored. She still got tired before she had them all matched. Workboxes are still so new to her and she seems to get impatient easily with the work. She enjoyed looking at the colors and kept commenting, "This is the prettiest pink!" Fun Factor: 3 out of 5 for my girl.